How difficult is this going to be? How much do I need to change what I’m already doing? What’s in it for us as a group? The first two questions can trump the others. No matter the payoff, if it’s too much of a change or is perceived as too difficult, you won’t reach the critical mass of users that will make the answer to #4 compelling. When it comes to politics, it seems we all want change. But in the workplace we like our routine. That’s change we can believe in. Everyone uses email at work. Everyone complains about getting too much of it. If a tool can reduce unwanted and irrelevant email messages while still giving you access to the information if you later need it, that would be a great value, wouldn’t it? And if you could mostly use it right from your email client (i.e. Microsoft Outlook, Entourage or Apple Mail), wouldn’t that make the burden of questions 1 and 2 almost nonexistent? 1. 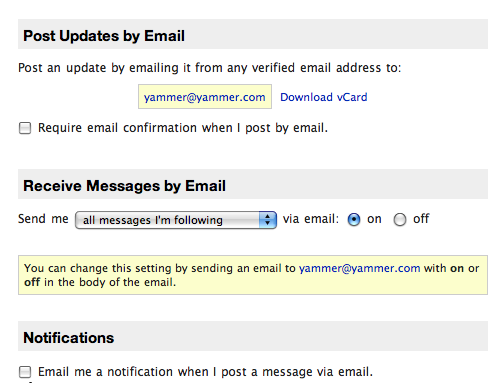 Sign up for Yammer using your work e-mail address. This is covered in more detail in Yammer 101. This will ensure that you get e-mail notices of new posts from any people you are following and for any tags (or topics) you follow. To cut down on unnecessary email, I suggest that you de-select requiring confirmation of posts via email and notification of new messages you post via email. 4. When you want to send a message to other staff who are interested in these topics, instead of deciding what email distribution list to use, Yammer instead using the relevant tags. In this way, everyone who has followed the tag will get an email. You don’t have to pick a distribution list. The users have self-selected. In addition to the main tags that refer to the interest group that should receive the message, feel free to add any other tags that would help you find the message later. Creating a tag is as simple as putting a # in front of a #word or #phrase-joined-by-hyphens. Once you have done the set-up in Yammer, which takes about five minutes, this is the only step that involves any change from the way you currently exchange information by email. You’re just using Yammer instead of a distribution list. And I would suggest that this is even easier than email, because you can just get to the point and the format doesn’t encourage rambling messages. 5. When you get an e-mail message from Yammer relating to one of your tags, if you have something to say, just reply via e-mail as you normally would. Yammer will log your response and will send it to everyone else. You don’t need to log into Yammer and post your response there. Just send a plain old-fashioned e-mail reply, and Yammer will take care of the rest. Your message will become part of the thread…as the recorded customer service messages say, “in the order it was received.” The entire conversation and its resolution is archived for reference. 6. Read messages you get from Yammer, and then delete them. You don’t need to save messages, because if you later need them you can search for them within Yammer. For more background on Yammer check out the full Yammer curriculum.